Grind whole peppercorns with mortar and pestle. Rub steaks with olive oil. 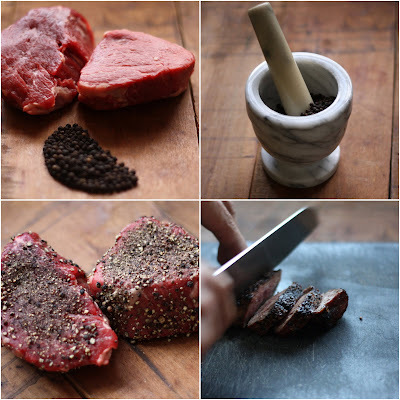 Rub/heavily coat steaks with ground peppercorns. Grill steak to your liking and by the way, your liking is medium rare (roughly 4-6 minutes per side on a hot grill). Arrange organic spring mix in bowl and add anything else you like in a salad. Good crumbled blue cheese is a must. Apply dressing of your choice (Oil and Vinegar does nicely) to salad before the steak. Slice the steak and add to salad. Leave a comment thanking me for the ease of this wonderfully simple meal. This looks delicious Tim. Thanks for the inspiration, will try this at home.